RC Monster Truck Just $14.95! Down From $40! PLUS FREE Shipping! 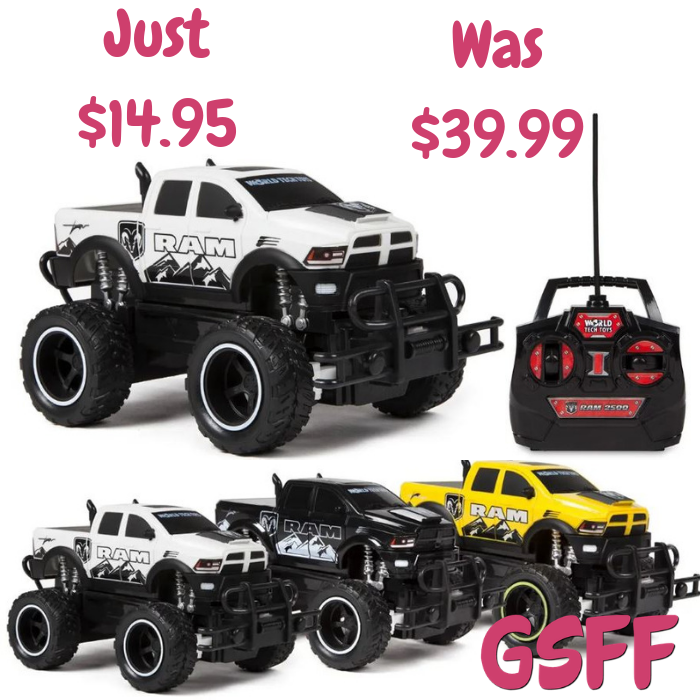 You are here: Home / Great Deals / Christmas Deals / RC Monster Truck Just $14.95! Down From $40! PLUS FREE Shipping! TODAY ONLY! Hurry over to Jane where you can score this RC Monster Truck for just $14.95 down from $39.99 PLUS FREE shipping! Get Ram tough with the World Tech Toys Dodge Ram 2500 1:24 RTR Electric RC Monster Truck! This cool full function RC truck is officially licensed! It features big rubber off-road tires that can climb over almost anything! Made in the image of the Ram 2500, this awesome monster truck features a hood scoop and dual vertical exhaust pipes. All you need to do to get this beast running is add 3 AA batteries to the vehicle plus 2 AA batteries to the transmitter and you are ready to go! Don’t be afraid to take on any obstacle with the World Tech Toys Dodge Ram 2500 1:24 RTR Electric RC Monster Truck!